Semi- Skilled Rigger posts on contract basis. All the vacancies in CSL Recruitment are temporary in nature, maximum for a period of 3 years. During the 1st year candidates will be offered a pay bond of Rs. 14,000/-, during 2nd year Rs.14200/-, during 3rd year Rs. 14,850/-. The mode of selection for CSL Fabrication Assistants and Outfit Assistants jobs is based on Practical test. Candidates who are interested for these CSL Welder jobs can submit applications before 13-02-2019. For Shortlisted candidates, Practical test date will be intimated through CSL website/ Email/ SMS. 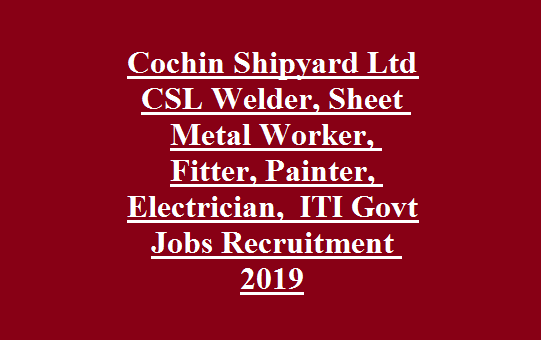 Complete details regarding Cochin Shipyard Limited CSL Recruitment of Welder, Sheet Metal Worker jobs are given below. Total no of vacancies are 195 posts. - Sheet Metal Worker: 06 posts. - Fitter Pipe (Plumber): 25 posts. - Diesel Mechanic: 06 posts. - Shipwright wood: 02 posts. - Electronic mechanic: 03 posts. - Instrument Mechanic: 02 posts. Scale of pay offered for the candidates applying for CSL Recruitment jobs is Rs.14000/- plus Rs. 4200/- for extra hours during first year. Maximum age should not exceed 30 years as on 13th Feb-2019. For SC/ ST age relaxed by 05 years, for OBC 03 years age relaxation will be given and for PWD 10 years age relaxation will be given. Minimum required qualifications for all posts in CSL Recruitment is SSLC pass and ITI (NTC) & NAC (National Apprenticeship Certificate) in respective trade. Minimum 3 years post qualification experience is Essential. For Semi Skilled Rigger posts candidate need IV class pass. Method of selecting candidates for CSL Recruitment jobs is based on Practical Test. Schedule date of Practical Test will be intimated soon through SMS or Email or CSL Website. Application fee for General/ OBC candidates is Rs.100/- for others application fee is nil. 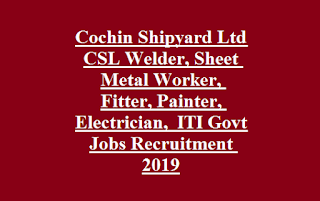 Eligible candidates kindly visit the official website of CSL http://www.cochinshipyard.com to apply for CSL Recruitment vacancies. Applicants must fill the all the columns carefully and submit trough online from 24th Jan, 2019 to 13th Feb, 2019.